With the new international terminal at Bajpe airport now ready for commencing operation, the AAI is hunting for a suitable inaugurator and it is no mood to settle anybody else than the prime minister, after all, it is one of the land marks in the country. The integrated international terminal as it is called, is situated next to the old upgraded terminal. It has modern amenities and facilities like aerobridges which will facilitate the passengers to walk out of the aircraft directly into the airport arrival lounge without have to bear the heat of the tarmac between the aircraft and the arrival lounge. The baggage clearance area has been made more spacious and the movement of the baggage on the conveyor belt faster. On the departure side, the AAI has made even better passenger amenities like international standard cafeteria, upgraded waiting lobbies with wi-fi hotspots, banking facilities, elevators and other facilities. Public address system has been further clarified which enhances the clarity of the announcer’s voice. But will there be more airlines starting their services from Mangalore to different destinations around the globe? When asked, the AAI authorities said presently the Kingfisher, Jet, Air India Express and Air India Regional were operating domestic and international routes like Abu Dabhi, Baharain, Doha, Kuwait, Dubai and Muscat. 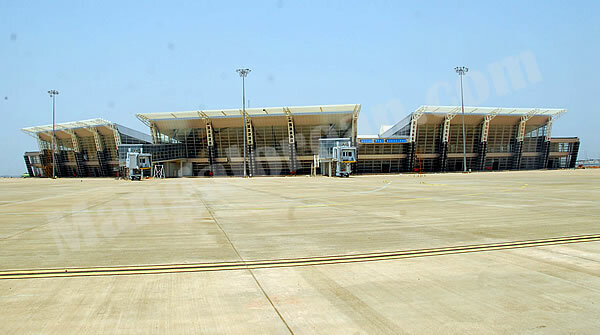 The city is also connected to the US, UK, Australia and other countries via Bangalore International Airport at Devanahalli, which was enough to make the Mangalore International Airport the second best connected airport after Bangalore in Karnataka state. The Airport today has traffic of 32 flights landing and taking off every day and has nearly 2500 passengers arriving and departing. According to the General Manager of the Mangalore International Airport, Mr. Peter Abraham, every operation of the Airport has been made compatible with the international standards. Mangalore airport has been prepared to take up technology integration at any point of time in the future and even in the present context it was one of the best technology integrated airport, he added. The travel time to the new terminal from Mangalore city, when fully operational, will be 8 kilometers lesser than the old terminal at Bajpe. This was due to the fact that the new terminal was situated in Kanjar and was directly accessible from the state highway. In addition, a new Zilla Panchayat road has been constructed to the distance of 1.7 kilometers to join the Dakkan park road which will make the new terminal even more closer. Speaking to Mangalorean.com, MP of Mangalore, Mr. Nalin Kumar Kateel, said that the terminal was ready for inauguration and would be soon inaugurated though it was not definite who would inaugurate it. "I agree that it should be the chief executive of the elected government. I have told the AAI authorities that the passengers coming and going from this airport this holiday season should get the benefit of the new international terminal. Though major structural works are over, there are many more to be completed including interiors, false roofing, ducting and sound proofing. According to my sources these things could be completed within a month or two. I want the passengers arriving for new festive season this year to arrive in the new terminal," Kateel said. He also added that Mangalore which is now on the world map of development would get more flights from different parts of the globe. "The airport parking bay can now hold upto five aircrafts at a time and the expansion work is going on for accommodating two more flights," he said. "The new terminal building is ready in all respects, we have completed all works and allotted slots to each of the airlines, concessionaires and most of them are now busy setting up their offices and making minute adjustments according to their company requirements" says Mr. Abraham. "The beauty of this new terminal is that it is comparable to any international airport either in Mumbai or Delhi. Though it is scaled down in size and operations due to traffic, passengers will get the same type of service and facilities what they get in big cities elsewhere" he said adding that "Aerobridges, elevators, escalators, easier exit and entry into airport from the car park area have been as scientifically designed on the lines of its metro cousins." Mr Abraham said the new terminal at Bajpe was one among the 35 other tier II city airport expansions all over the country, but each airport was different in design, but there is a brand equity in service and facilities he added. He said "though there are only two aerobridges right now provision has been made to install more if needed at the new terminal. Mangalore airport has an advantage of having five aircraft bays at the new terminal and five more at the existing terminal. Even when the arrival and departure operations are fully shifted to the new terminal the old terminal building will be kept ready for taking up arrival and departure operations at short notice," he said. According to the sources in the civil aviation ministry "there was nothing to stop Mangalore airport from getting the international tag as it now has the customs coverage. There are enquiries from various airlines plying on both domestic and international routes to operate from Mangalore, since international airports in Bangalore and Kochi are far away from the coastal area of Karnataka. Mangalore will see a spurt in international traffic once the new terminal at Mangalore was declared open," Mr Abraham said.